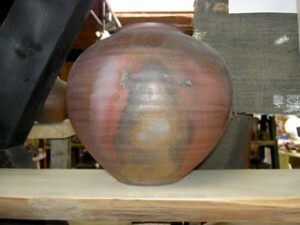 There are 500 to 1000 historical pottery areas in Japan, and Tsugaru Kanayama Pottery is historically new among them. Although Tsugaru Kanayama pottery is historically new as mentioned above, its artworks make us feel nostalgia. 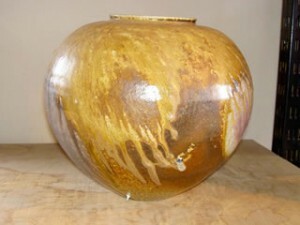 Artworks of Tsugaru Kanayama Pottery fill up our heart with warmth, for us living in modern times. 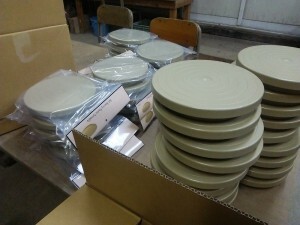 Tsugaru Kanayama Pottery has been thinking to get the best resources and to take care of nature. We are using high quality clay which has been dug from the bottom of our local reservoir. We are also using local Japanese red pine wood to fire our kilns. 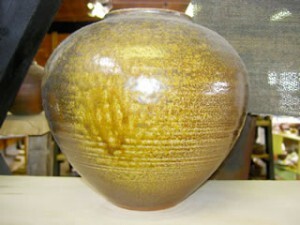 Tsugaru Kanayama Pottery is deeply influenced by Sueki. Sueki (Sue ware), unglazed pottery made from the middle of the Kofun era through the Heian era, used to be remained in Kanayama area once. 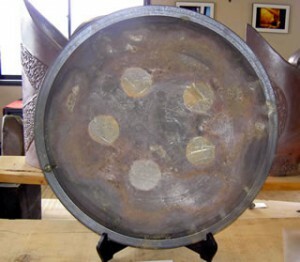 Now, we are producing pottery that has a unique deep texture by firing works carefully at a high temperature of 1350 ℃（2462°F ). It is the passion of potters that drives Tsugaru Kanayama to continue making pottery. 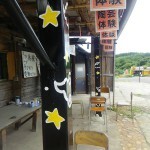 We, at Tsugaru Kanayama, keep in mind that nature and human beings create together. Making use of the origin for pottery today, and continue to follow our own path of ”New traditional pottery”. When pine ashes used as fuel spottily sprinkle on pieces in a kiln, it looks as if sesame seeds are sprinkled on pieces and cover pieces. This pattern is called “Goma” . When potteries(wares) are placed near the fire, they get heavily covered with ash. 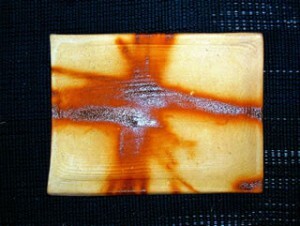 Then, the sprinkled ash on the potteries ,which is called “Goma”, melt and run on the surface. This pattern is called “Tamadare”. The potteries are buried beneath ash allowing fire and air flow on the surface of the potteries and do not get fire directly. Another is when wares are fired with a condition as fumed in a kiln because of less oxygen, colors of gray and blue are appeared on pieces. This pattern is made by putting a round plate or other pottery on a plate or a bowl, after firing the pottery on top leaves a round mark on the plate or on the bowl. Straws are winded on pieces not to touch each other in a kiln, and the straw’s winded part is fired with color of red.